Description: Our banner printing service gives you 800 mm x 2000 mm exhibition stands printed in full colour. The stand comes with its own carry case and a space for company ID/address label. Very easy to set up! Our roll-up banners are printed in full colour onto PVC Based Banner Material. Our price include a nylon zip-up carry bag and FREE delivery within 5 working days to one UK address excluding Highland and Islands and there is no charge for debit or credit cards. For deliveries to Highland and Islands please call for a price that includes delivery to these locations. If you need your exhibition stand sooner, contact us to discuss a quicker delivery time. What can printed pop-up exhibition stands do for me? 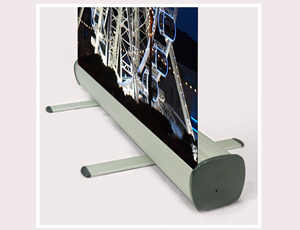 The roller banner stands are a high-impact, cost-effective display systems to advertise your product or service. The versatility and short assembly time make them ideal for a wide range of applications such as exhibitions, presentations, conferences etc. Azimuth Print, the UK's premier roll-up banner printer offers an excellent, low-cost exhibition stand printing service. We can print roll-up banners in 2m high x 800mm wide size. Pop-up stands are printed at 5000dpi. The stand comes with its own carry case and a space for company ID/address label. They are very easy to set up! We provide a free online exhibition stand design service. If you do not have print ready artwork and you would like to create your own exhibition stand design, try our Online Design Studio. You can create your artwork from scratch or you can select one of more than a thousand roll-up banner templates. Our Online Design Studio is easy to use and it is FREE! Set your artwork at full size, half size or quarter size. If setting your artwork at half size remember to double the resolution of the file to 300 dpi. You can either send us your own artwork or commission our designers to come up with a great look for your printed roller banners for an extra charge. If you need to make small changes to your copy and design, we can take care of these at no extra cost, while larger amendments to your pop-up stand can also be made for a fee. To find out more about the UK's premier pop-up banner printer, just get in touch for a quote or for answers to any questions you might have about our roller banner printing services.